He is discreet, Mourinho trusts him, and he has the talent. 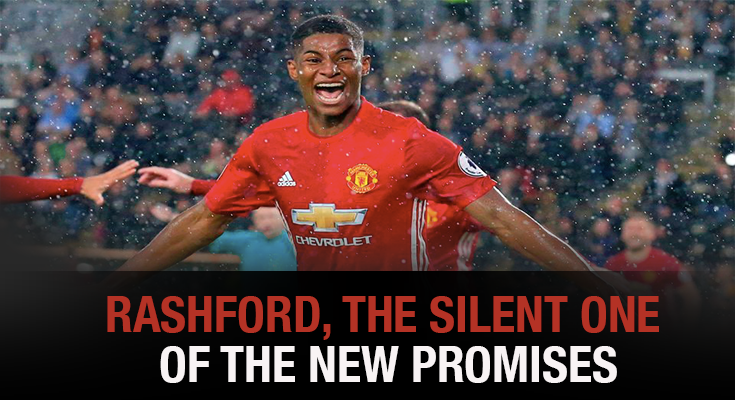 Marcus Rashford, along with Marco Asensio, Paulo Dybala,Paul Pogba, Dembele, among other players; are the so called big promises of the future of this beloved sport. But one of the big differences between these fantastic soccer players is that the most of them are already big and important names on their squads. However, Rashford, the new Manchester wonder kid, has been having more like a low profile role in this team that invested quite important amounts of money on key players that fits Mourinho’s game style. This doesn’t’ mean that his role and game when given minutes, (which lately has been quite a few), is less visible or important. The complete opposite, he takes the most of the minutes that he is given, and just like another rising superstar, Marco Asensio, Marcus Rashford has an impressive record, goal on each competition he debuts with the Manchester squad. Today was the latest chapter written on this 19-year-old youngster, on his first Champions League game and coming as a substitute he scored after a nice pass from another substitute, Fellaini; just as he scored in his first appearances in the Europa League, Premier League, FA Cup and League Cup and his international debuts at senior and Under-21s level. The arrival of big players, like Romelu Lukaku this summer, Paul Pogba last season, doesn’t seem to intimidate the young forward. He has a bright future ahead and needs to be patient, it seems that he has his manager on his side, Mourinho, which is very important; if he continues with good health, humble, patient, and listening and learning from the veterans stars he has next to him, (remember that Ibra renewed another year with the devils), I’m sure sooner that we expect his role in this team can be quite important.